After the flood God gave Noah and his family the same command He had given to Adam and Eve: be fruitful and multiply so as to replenish the earth (Genesis 9:1). Since the beginning God wanted the earth filled with people with whom He could have a relationship. This is why He gave the same command to the first man and woman, and also to Noah and his family after they survived the flood. In Genesis 10 we are told about the descendants of Noah. The Bible says that they all had one language (Genesis 11:1). The people sought to have a permanent home. They traveled eastward to Shinar (in modern day Iraq) to establish a civilization where all humanity could live together. But God did not want them to stay together in one place. He wanted them to spread out and inhabit the whole world. These were not cavemen like many evolutionists would like us to think. God created man with an incredible mind. These people had the ability to make bricks and mortar and build a city. They knew they could build a stronger and more knowledgeable community if they gathered together and shared their learning. They had begun to ignore God’s commands to inhabit the whole earth. They even created their own interpretation of who God was. They said they wanted to build a tower to reach to heaven. The belief was that God, or other deities they had invented, lived just above the surface of the earth and they could inhabit the space of God if they built a tower. It is thought that the tower they ultimately built was so that their gods could travel between the spiritual world to the physical one using these great ladders. The Bible also says that they wanted to make a name for themselves (Genesis 11:4). Who were they trying to impress? Besides the family of Noah, who else was there to make a name for themselves for? They knew God. The story of the Tower of Babel took place about 100 years after the flood. Their grandfather had a personal relationship with God. They had heard stories of how God operated. They knew what His commands were. Yet they wanted to make a name for themselves that would make them equal with God. God came down for a visit (Genesis 11:5). He said to Himself (God the Father, Son, and Holy Spirit) that man was capable of accomplishing anything he set out to do when they were all gathered together. It was not that God did not want man to increase in learning, but that their sinful nature caused them to swell with pride and think that they could elevate themselves to be like God. This combined learning and knowledge would continue to grow. God knew the volume and depth of sin would continue to increase in a large combined population. God confounded their language (Genesis 11:7, 8). The Bible does not indicate how many language groups there were, but they were diverse enough that the people were not able to communicate with others outside their language group. Noah’s descendants needed to find others with whom they could communicate. They could not stay and build the city. God wants to have a relationship with us. He has given us His Word so that we can see how He has dealt with man in the past. Many times man tries to do what he can to rise up to the level of God. It seems odd to us today to build a tower for the purpose of reaching heaven. Yet, people try to put themselves on equal footing with God when they throw out what the Bible tells us about creation and the history of man and try to formulate their own model of the beginning of the world. Allow God to speak to you through His Word. He has created a way to come to us and lift us to His level through His Son. We can’t reach God by the things we try to do or build. We can only go to Him through Jesus Christ. I love the way you said that these people were not ignorant cavemen, but intelligent, capable men and women. Great job. If I may discuss a few of your comments and have you reply and clarify some things. I don’t have scripture with me to address certain things, but allow me some leeway in expressing my understanding. You mentioned in the first paragraph that God wanted to have a relationship with us as the reason for us to multiply. Well, I don’t think it was about just the relationship that He wanted. He had a relationship with Lucifer in story of a Job. He had a relationship with the Angels. You could say He was wanted a good relationship. I would say that He wanted us to choose Him as our Inspiration. But, it’s very important to realize, He recognized that the relationship involved choice. There is no way I can see that He would want or could have a good relationship with us without our consent. We need to have that option of “being like Us”, knowing good and evil for our relationship to have any real meaning. The Adam and Eve story should reflect that those first two people were brave enough to go out beyond the boundaries set and begin the process of the human soul to learn about our nature and to choose God-like virtues. It should not be about our sin because, there is no way to choose God without being able to choose not god. It seems silly to think that Our Creator would set up a test run to challenge absolute obedience without us knowing good and evil but only obedience. What do you believe about the story of Adam and Eve? Parable or historical? There is one other point that I do not agree with in your discussion. You say, God knew that He ” the volume and depth of sin will continue to grow in a large combined population.” Really…? We have much more diversity than a single group today and what we have is ignorance, hatred, apathy as well as the good attributes of faith, hope and love in each one. So, what you have in one population, you are destined to have in each and every one. So, separating the nations seems more geological to me than disciplinary. 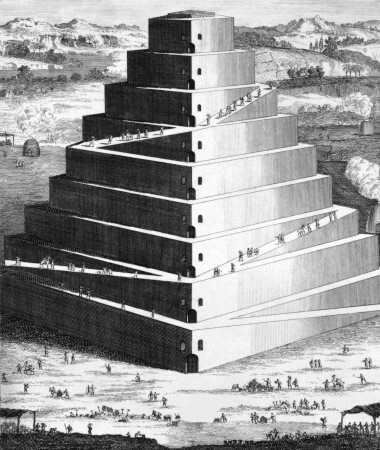 Tower of Babel…parable or historical? I hope you are not offended or defensive while reading this. I would enjoy to discuss these and other topics more. I am not saying I have the answers, but just that some of the ones you expressed seem convoluted or indoctrinated. A new book says that Babel and the landing of the ark was on what we call Pangaea. That makes sense because spreading out to all the continents would have been easy.